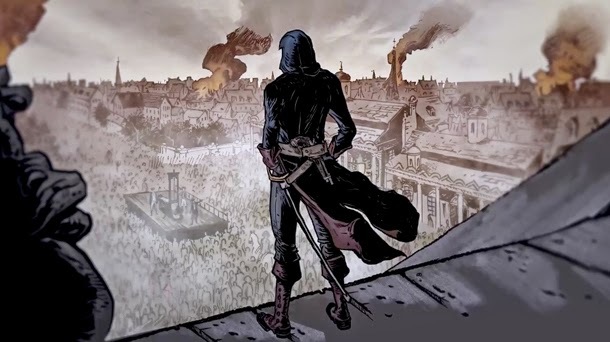 Rocker and filmmaker Rob Zombie and The Walking Dead co-creator Tony Moore have teamed up with Ubisoft to create an animated trailer for their forthcoming game release, Assassin’s Creed Unity. The pair were asked to depict the chaotic and brutal events behind the French Revolution, the setting for the new game. In addition to the video, producers are sharing a behind the scenes look at the development of the trailer. Assassin's Creed Unity will be available worldwide on October 28th on Xbox One, PlayStation 4 and PC. As for Zombie, he’ll kick off a series of US dates in Portland, Oregon on September 8. In May, the rocker released a new live DVD, “The Zombie Horror Picture Show”, which captures Zombie in concert last summer in Houston (Aug 3) and Dallas (Aug 4) during the final two shows of the 2013 Rockstar Energy Drink Mayhem Festival.